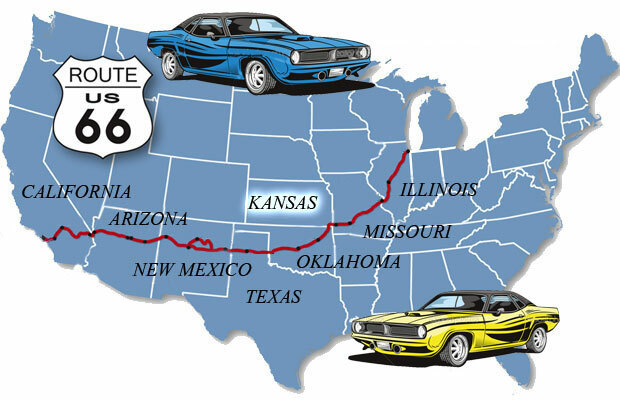 14-mile slice across the south-east corner of Kansas, makes it the shortest but perhaps best – signed stretch of Route 66 with many stops for fans of the old road and old-fashioned milk shakes. Its name derives from Kansas Native American tribe, which inhabited the area, and means “people of the wind”. Wichita is the largest city in the state by area and population. From old west history to a relaxing and restful getaway in some of the 24 state parks across the state, Kansas offers many great adventures on your route. Hundreds of lakes, thousands of ponds and stream lines provide excellent opportunities for anglers, swimmers, skiers, boaters, and other water fanatics. Wildlife observation, farms, ranches, wineries, scenic and historic drives, there’s simply a world of outdoor adventures waiting there for you! 4 Women on the Route : Location – Galena. An old gas station set in front of an abandoned warehouse that was a hideaway place for the outlaws Bonnie and Clyde. It serves gasoline no more but you can find there some souvenirs, snacks and the rusty tow truck parked outside, that was the inspiration for the character “Mater” from the “Cars”. The Marsh Arch Bridge: Location – Eureka. Route 66 used to ran through three similar bridges but this one is the last one standing. Restored but still closed to traffic, it rests in a quiet countryside away from the main traffic that It once knew. The Phillips 66 Station: Location – Baxter Springs. Visitor centre and beautiful station of the legendary brand “Philips 66”. Nelson’s Old Riverton Store: Location – Riverton. Groceries, antiques and souvenirs museum which also houses the Kansas Route 66 Association. Prairie Trail: Distance – 23 miles, 30 min from Kansas City, KO. Travelling the Prairie Trail Scenic Byway, you will follow in the steps of Native Americans, explorers, pioneers and huge herds of bison that roamed the majestic Flint Hills. Attractions – Horse Riding, Biking, Hiking. Frontier Military Historic Byway: Distance – 30 miles, 40 min from Kansas City, KS. Travel through time and visit multiple forts along the Frontier Military Byway which were built to move soldiers and supplies. Attractions – Horse Riding, Hiking, Biking. Native Stone: Distance – 75 miles, 1 h 10 min from Kansas City, KS. The Native Stone Scenic Byway of natural wonder of rock formations and the craft – work of masons who built the small towns with the same stone. Attractions – Hiking, Swimming, Boating, Pickniking, Horse Riding. Glacial Hills: Distance – 95 miles, 1 h 20 min from Kansas City, KS. Rolling hills and rock-strewn valleys carved by ancient glaciers. One of the most famous Pony Express routes used to run through here. Attractions – Hiking, Picnicking, Fishing. Gypsum Hills: Distance – 102 miles, 1 h 20 min from Wichita, KS. Ancient floodplains, canyons, mesas, buttes and sink-holes nestled in the Kansas grasslands are known as the Gypsum Hills, or Red Hills, and deliver plenty of diversity for outdoor enthusiasts. Attractions – Horse Riding, Hiking, Biking, Spelunking.